I am usually quite a skeptic when it comes to lilac or purple nail polish shades. I feel like they just don’t suit me even though my skin is pink toned and has cool undertones to it. I’ve tried many lilac shades from different brands and the only two I like on me are Essie Lilacism (review here) and OPI Do You Lilac It?. When I saw Do You Lilac It? at Sephora last year I fell in love with it immediately. I was afraid that it might be yet another one of those purples that I will never wear but I decided to go for it regardless. Luckily, the minute I applied it I LOVED it and it’s now a proud member of my Top Summer Nail Polishes. (: Do You Lilac It? is this gorgeous light, sweet pastel-y purple shade, which is super pretty and especially great for the warmer months. It doesn’t have any shimmer or glitter in it and dries to a gorgeous glossy cream finish. As I said, it compliments my skin tone beautifully but I am not too sure how it will look on you if you have more distinct warmer tones to the skin. What I love about this little beaut is that it could be actually worn on your toes as well (if you’re a bit more daring), which I love. We all know that I tend to be a bit matchy-matchy sometimes so this is perfect for me haha. I feel like the beauty world kind of splits up in two when it comes to nail polish formula. Some prefer OPI and some, like myself, are more of Essie girls. As for the formula of Do You Lilac It? I think it’s safe to say that it’s okay. It is a bit more watery for my liking, therefore I find that it applies a bit thin so you’ll definitely need at least two coats to get it fully opaque. I love it that this nail polish is not at all streaky or gloopy and it is completely hustle-free! :) It applies smoothly and dries out quickly so I don’t have to worry about messing my entire manicure up. Have you tried Do You Lilac It? Which is your favorite Purple / Lilac nail polish? This colour is beautiful! I am always drawn to these shades of purple. I think this will be next on my beauty wish list! This is such a pretty shade and I love the fact that it's a good toe colour too. I'm definitely more of an Essie girl like you but it's good to know that the formula of this polish isn't too bad because i've been thinking of adding some OPI polishes to my collection. Not usually a fan of purples and lilacs-but this is so gorgeous!! Such a pretty colour I absolutely love how you photographed it! Stunning! This color looks amazing!! I too am more of an Essie girl but sometime I will find a nice OPI nail polish such as Jade is the new black!! This is the best nail polish colour ever, so pretty! Thats such a nice shade. I'm yet to try out an OPI nail polish. omigosh such a pretty color. ive wanted a pale purple/lavender/lilac color for a while. might check this one out! Oh my this colour is beaut! I have the saaame ! i love the color ! This is stunning!!! It looks incredible with your skin tone! I love it. would you be interested in doing a follow for follow?? This colour is so perfect for summer! I fell in love with the color of that nail polish! and I love your blog so much, too! omg it's such a pretty, pretty shade! 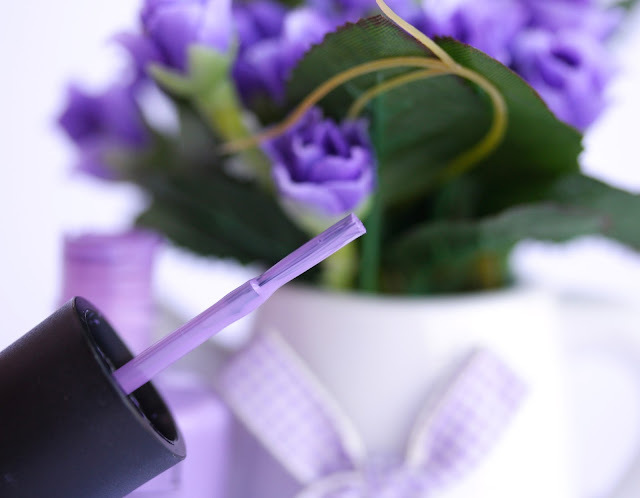 I love lavender and lilac colors, they're so my style...thank you for sharing dear! What a gorgeous colour! The pictures are lovely, too! OMG loveeee this color!! you took incredible photos! 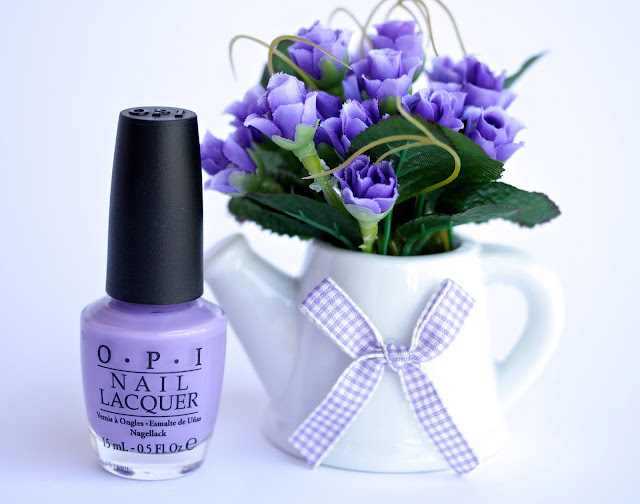 That's such a pretty shade of purple, I also like Lucky Lucky Lavender by OPI! Such cute pictures and what a lovely colour!!! Catherine | Vanilla. Fashion. Thoughts. This is truly an AMAZING colour!!! This is really well-suited to your skin tone and looks gorgeous! I love it! I loved your comments about Essie/OPI girls and you're right! I am definitely an OPI girl, but Essie Geranium and Set In Stones are in my top 10 all-time favorites! Set In Stones is my favorite glitter ever! such a pretty color and such a sweet pictures youve taken! I have this polish and I love it too, such a pretty colour. I've only just found your blog but I love it, your reviews are really informative and you have the best pictures!